Meditation is making its way back on to the agenda of the 21st Century. From corporate executives who swear it helps them become more effective leaders, and school children in classrooms, to ordinary folk who find meditating gives them the tools to better deal with the stresses of modern life. In this frantic, hurly burly world, there is a quiet, steady revolution going on. An ancient, sacred practice is enjoying a period of unprecedented popularity amongst both religious and non-religious people alike. But what exactly is meditation and what are its religious and philosophical roots? Well, it’s a tricky word to define but at its very simplest it means living purely in the moment, paying attention to what you are doing, as you are doing it. Now there's a vast and bewildering array of meditation techniques to achieve that state, but generally what they all aim to develop are the qualities of self awareness, of focus and compassion – and ultimately of insight and wisdom. Most spiritual traditions include forms of meditation, perhaps involving quiet introspection or religious contemplation. But it’s Buddhists who have placed meditation at the very heart of their philosophy and belief system. For them meditation is an important component of their path towards spiritual awakening, enlightenment. Over the centuries a huge diversity of meditation practices have been developed within the various Buddhist schools. Buddhism asks its followers to understand the world and themselves in a deep and transforming way. If they succeed, they are ‘awakened’ or buddha. Meditation is one of the tools that Buddhism employs to bring this about. It already existed in the Hindu tradition, and the Buddha himself used meditation as a means to enlightenment. Over the centuries Buddhism has evolved many different techniques: for example, mindfulness; loving-kindness and visualisation. 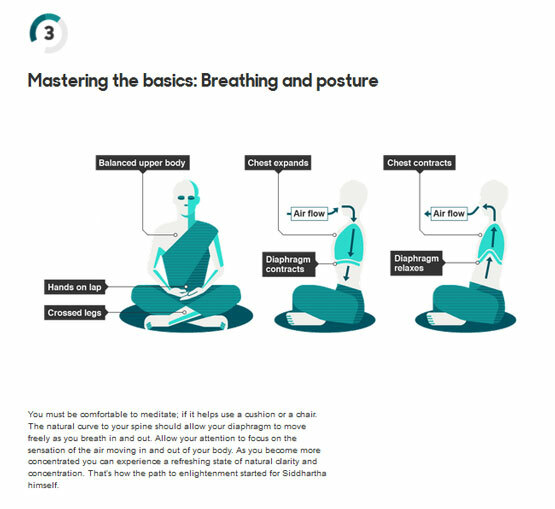 A skilled meditation teacher can pass on specific techniques according to individual needs. 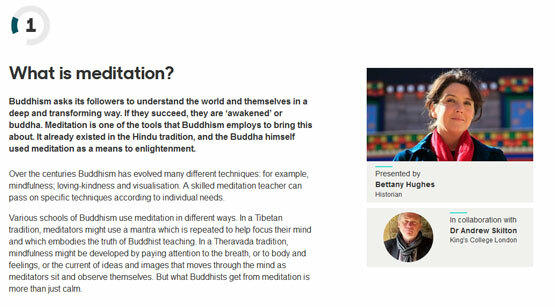 Various schools of Buddhism use meditation in different ways. In a Tibetan tradition, meditators might use a mantra which is repeated to help focus their mind and which embodies the truth of Buddhist teaching. In a Theravada tradition, mindfulness might be developed by paying attention to the breath, or to body and feelings, or the current of ideas and images that moves through the mind as meditators sit and observe themselves. But what Buddhists get from meditation is more than just calm. I’ve come to the Tibetan Buddhist centre at Samye Ling in Scotland to discuss meditation with Ani Llamo, who’s been a Buddhist nun here for over 25 years. Can you tell me why you meditate? Ani Lhamo: It's something that totally sustains me and it's a bit like taking medicine or vitamins. Normally we think mainly in terms of keeping our body healthy, so meditation is about keeping the mind healthy. Definitely life is much more peaceful, happier, easier to achieve what we can achieve. Easier to assess and not worry about the things we can't achieve. Easier to relate to the world, to others and of course to oneself. Bettany Hughes: How do you actually manage to stop yourself getting distracted when your mind is racing and full of other things? Ani Lhamo: To be able to settle the mind we use some kind of object and the easiest one in a way, is the breath, because it's there anyway. So what we do is just bring our attention on to the breathing, not to try and change the way we are breathing, to notice it. The simple act of following the movement of the breath is something very profound. Just step, by step, talk me through a typical meditation process for you. Ani Lhamo: The first thing is to sit in a comfortable, but balanced position, with the back straight, but not too tense. And then the idea is to allow oneself to relax physically and also mentally. So whatever it is that is disturbing us, big worries about work, life and all that's going on, let that recede a little. And to help that process, follow the movement of the breath or focus on one thing and use that as a means of being less distracted by the multiplicity of thoughts and emotions. In the beginning our minds are like a crazy waterfall, just cascading down and carrying us with it and gradually it becomes more stable but meandering river running along. And eventually the aim is to be like a vast still ocean. Anything can happen, but the ocean itself is not disturbed. You must be comfortable to meditate; if it helps use a cushion or a chair. The natural curve to your spine should allow your diaphragm to move freely as you breath in and out. Allow your attention to focus on the sensation of the air moving in and out of your body. As you become more concentrated you can experience a refreshing state of natural clarity and concentration. That’s how the path to enlightenment started for Siddhartha himself. 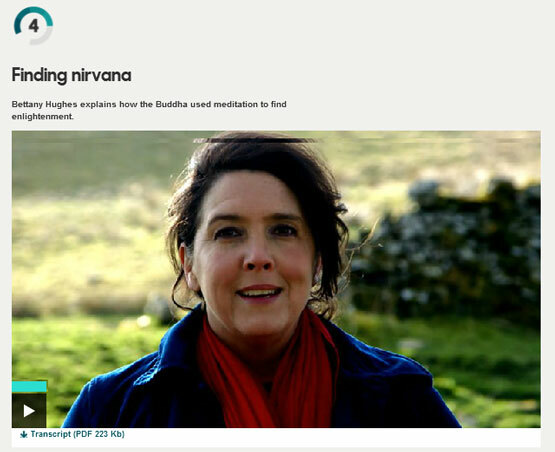 Bettany Hughes explains how the Buddha used meditation to find enlightenment. It was while he was sat meditating under a tree that the Buddha attained enlightenment. The story goes that Prince Siddhartha Gautama had given up a life of great wealth and privilege to wander, penniless as a holy man, seeking enlightenment. Siddhartha sat and entered a state of subtle absorption, something he had perfected during his years of training. He began to closely examine his own mind, and even his former existences, searching for an understanding of how to be free. Visions of pleasure and diabolic dread raced through his mind, but nothing could distract him. And then, after many days, it suddenly seemed as though he had been released from all the things that had been troubling him. Siddhartha was able to see things as they truly were. He was free from desire and attachment to existence. He understood that all things are impermanent and are incapable of providing ultimate satisfaction in themselves. He had become the Buddha, the awakened one. The ultimate goal for a Buddhist is to reach that state of enlightenment, or nirvana, and meditation is a key technique to achieve it. But meditation isn’t just a question of philosophy or faith or belief system. Now scientists are charting its quantifiable positive wider impact on both body and mind. Whatever you think of Buddhism itself, clearly 25 centuries ago the Buddha was onto something. 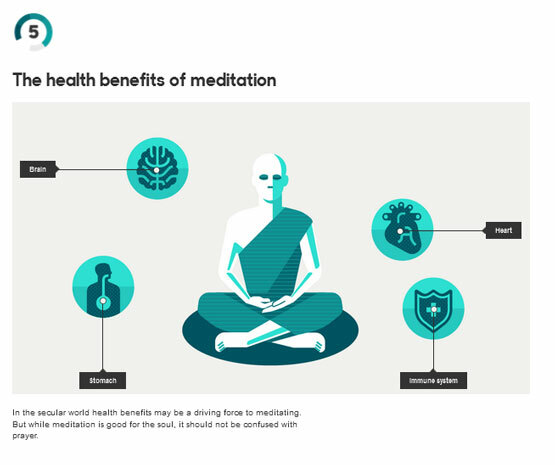 In the secular world health benefits may be a driving force to meditating. But while meditation is good for the soul, it should not be confused with prayer. A Tibetan pilgrim in Lhasa using a prayer wheel. From the outside some people think that meditation looks like prayer. Prayer is about petitioning a higher power, usually a deity and worshipping them. People pray for different reasons, sometimes to serve a deity, sometimes to express their beliefs or sometimes to ask for help. Meditation is about the guided transformation of the practitioner through their own effort. This is easy to see with mindfulness: you simply pay attention to your own body and mind. But even in Tibetan Buddhism, where the meditator might visualise a Buddha or lives liberated from suffering, there is still an understanding that that picture is created by the imagination, and that ultimately the meditator is appealing to their own higher potential for assistance. A Buddha seen in meditation is understood to be transient, just like everything else in human experience. 7. How can we meditate in our everyday lives? 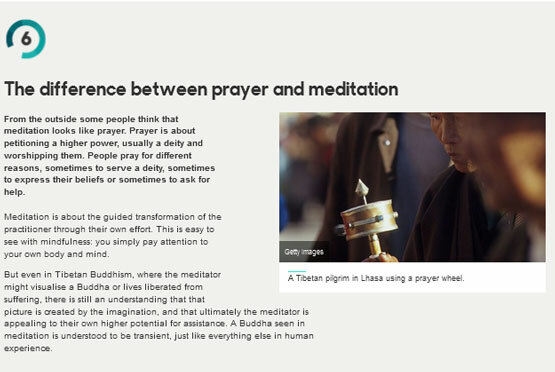 Here are a few examples of how meditation is being used in the secular world. Dr Anthony Seldon head of Wellington College introduced mindfulness to his school: "It has made the students calmer and more self-possessed. Teachers notice the difference when they have had stillness sessions. Classes are more harmonious and productive. So too are meetings with adults when meetings begin with a mindfulness session." Jenny Edwards CBE, Mental Health Foundation: "Mindfulness meditation helps people change the way they think and feel about their experiences, especially stressful ones. By paying attention to your thoughts and feelings you become more aware of them and better able to manage them. Mindfulness helps induce relaxation, which is a physiological response that slows heart rate, drops blood pressure, and decreases the levels of stress hormones." 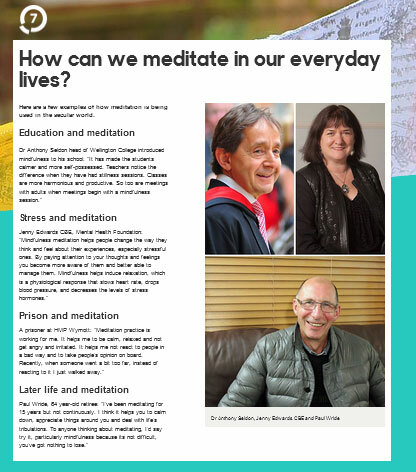 A prisoner at HMP Wymott: "Meditation practice is working for me. It helps me to be calm, relaxed and not get angry and irritated. It helps me not react to people in a bad way and to take people’s opinion on board. Recently, when someone went a bit too far, instead of reacting to it I just walked away." Paul Wride, 64 year-old retiree: "I’ve been meditating for 15 years but not continuously. I think it helps you to calm down, appreciate things around you and deal with life’s tribulations. To anyone thinking about meditating, I’d say try it, particularly mindfulness because its not difficult, you’ve got nothing to lose."